We are pleased to have Peternelle van Arsdale stop by to share more about her latest novel THE BEAST IS AN ANIMAL. Peternelle, what was your inspiration for writing THE BEAST IS AN ANIMAL? I was largely inspired by the dark fairytales (especially Grimm Brothers) that I read and loved as a child, and continue to love as an adult. Fairytales such as “Rumpelstiltskin” particularly fascinated me, because no character in it is purely good or kind, and it’s full of lies and betrayal. These are stories meant to scare you, and I loved to be scared by stories. The section of the book I have the most affection for is the prologue, because writing it was such a creatively wonderful experience. It was one of those times when you sit down and start writing and it all just flows—at the end I couldn’t have told you where it even came from. Two very different (and yet in some ways not so very different) works come to mind. They’re by two of my all-time favorite authors, and while I would never presume to put myself in the same category, I was certainly inspired by them. The first is the HIS DARK MATERIALS trilogy by Philip Pullman. He grapples with so much in those novels while also telling such a heartbreaking and emotionally resonant story. I would like to think that my novel would appeal to some of the same readers as those books. And another book is THE HANDMAID’S TALE by Margaret Atwood. There is an allegorical aspect to that and a strong feminist backbone that I think my novel shares. How long did you work on THE BEAST IS AN ANIMAL? Ages. It went through many incarnations, because I was really learning how to write a novel as I was writing it. This would seem like an odd thing for me to say since I’ve edited many novels—but that’s a very different thing from writing one. And my freelance work is another reason it took so long--I was simultaneously working as an editor and ghostwriter, so I went at it in fits and spurts while I was also making a living working on other writers’ books. It taught me that I will not give up if I really love and believe in something. This novel went through so many drafts, and there were so many disappointments along the way—times when I thought, that’s it, I can’t do one more draft. But I loved it too much not to keep trying. What do you hope readers will take away from THE BEAST IS AN ANIMAL? Oh! Honestly, I’m most interested to discover what readers take away from it. I like to think it’s a novel that operates on multiple levels and different readers (and possibly readers at different ages) will latch onto different things. But I suppose what I most want readers to take away is at least a moment of the magic I felt as a young reader—that sense of being utterly lost in a book that spoke to me. Since I worked in publishing for many years as an editor, I was lucky enough to know agents and publishers, but I worked with adult books, which at the time was still a very separate world. That said, I did have the benefit of understanding book publishing, and an agent friend of mine is the one who passed my novel along to the person who became my agent—Rebecca Sherman at Writers House. So that helped tremendously, but I still had to go through draft after draft to get it right. Luckily, Rebecca fell in love with the prologue for the novel and she kept the faith even when the rest of it was a mess. I wrote two other YA novels before THE BEAST IS AN ANIMAL, neither of which shall ever see the light of day. There was a moment when I realized that I was writing a novel I thought I should write instead of the novel that I really passionately wanted to write. Once I knew that, the rest wasn’t easy, but at least I had a beacon to steer toward. For my first novel, I worked from home, on my laptop, wherever/whenever it was quietest and I had the time. I’m envious of people who can listen to music, but I just can’t. Too distracting. For my second novel I’ve been working in the library and I’ve been able to be more systematic and regular in my work schedule, which has been hugely beneficial. It seems simplistic, but I guess I would say that you should always write a book you’re passionate about and would want to read. To me, the hardest job isn’t writing, it’s writing something you don’t love. I’m working on another dark fairytale that I’m excited about. It’s not a sequel to THE BEAST IS AN ANIMAL, but it will very much appeal to the same readers. Alys was seven when the soul eaters came to her village--twin sisters who were abandoned by their father and slowly morphed into something not quite human. Alys, and all the other children, were spared the devouring—and were sent to live in a neighboring village. There, the devout people created a strict world where good and evil are as fundamental as the nursery rhymes children sing. Fear of the soul eaters—and of the Beast they believe guides them—rule village life. But the Beast is not what they think it is. And neither is Alys. Inside, Alys feels connected to the soul eaters, and maybe even to the Beast itself. As she grows from a child to a teenager, she longs for the freedom of the forest. And she has a gift she can tell no one, for fear they will call her a witch. When disaster strikes, Alys finds herself on a journey to heal herself and her world. A journey that will take her through the darkest parts of the forest, where danger threatens her from the outside—and from within her own heart and soul. Peternelle van Arsdale is a book editor turned young adult novelist. She still loves to edit, but has discovered that she likes to make up her own stories even more than she likes to fix other people’s. It’s less stressful. Also, she is controlling, and pretty much gets to say what goes in the worlds that she creates. She lives in New York City, where she owns a Metrocard and drives as little as possible. She has perfect control over her feet. 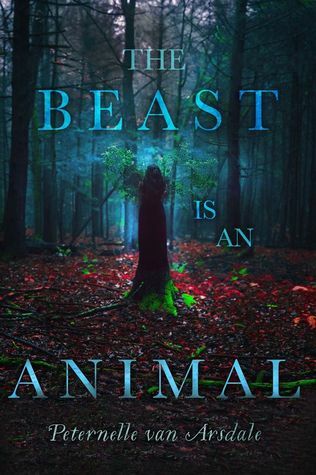 Have you had a chance to read THE BEAST IS AN ANIMAL yet? What books have you been utterly lost in like Peternelle? What was it that captivated you and brought you into that world? Do you like to be scared by stories? Tell us what your favorite "scary story" is? Share your thoughts about the interview in the comments!